“Ben Affleck got robbed.” Those are Bradley Cooper’s words, not mine. 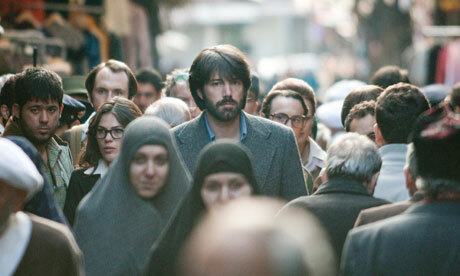 Though after finally seeing “Argo,” directed by Ben Affleck, I couldn’t agree more. "Argo" is as crisp and poignant a story as they come, based on our neglected history, it unravels swiftly and sharply even with some much-needed comic relief amidst truly horrific events. Directors that bring to life the history that we’ve been kept shut from, or components we are simply ignorant to, are to be applauded.This brings up the question, how was it that Kathryn Bigelow was also snubbed from a nomination from the Academy as well? Without diving into some conspiracy theory that I may or may not have ( which I would have so little knowledge of to even convey, let alone make sense trying to post at this time of night) I can’t help but wonder how politics plays into these nominations. How directors, who’s films captured thrilling American events, will show up at the Oscars without so much as a run at Best Director is beyond me. But at the young age that Affleck is at in his directing career, I’m sure the opportunity for a(nother) Academy Award in his lifetime is highly likely. And at the end of the day when the Foreign Film Press, the Screen Actor’s Guild and the British Academy all award you with Best Director of the Year, you’ve got to feel like you’ve done something right, huh? Well Oscar, how ‘bout them apples?